A group of dedicated elementary school students ‘litter-ally’ put Orangeville on the map earlier this year, embracing the now-global Litterati movement and helping to clean up the local community all at the same time. Introduced to Grade 7 and 8 students at Spencer Avenue Elementary School this year as part of a new inquiry-based learning initiative called The Global Innovation Exchange Project, the program encourages students to “think outside the box”, while also presenting an opportunity to learn in a format other than a classroom. Littering has been a problem around the globe for as long as humans have occupied it. With that said, the issue has intensified as years have gone by and there has been an increased focus from most of the developed world over the past few decades to cut down on littering. In their first field trip of the year, students visited Island Lake Conservation Area. It was there that they first learned about Litterati. While it is categorized as an internet application, most of the students in Ms. Gray’s class will testify now that Litterati is more of an ideology than anything else. In its mission statement, Litterati claims to be tackling what has become a worldwide problem one piece of litter at a time. In a special assembly held at Spencer Avenue ES on Nov. 23, students explained exactly how Litterati works. So, pretty much, Litterati has become a global library for litter. As of press time, 963,699 pieces of litter have been documented through the online “litter bank”. The United States, the most active country on the Litterati app thus far, has registered 492,059 pieces of litter. Canada is currently in fifth place, behind the Netherlands, UK and Australia, with 18,384 pieces of litter collected. Almost 16 percent of that total has been picked right here in Orangeville, with Spencer Avenue students accounting for 2,902 pieces of litter picked and documented. The group picked litter at Island Lake Conservation Area and in the neighbourhood surrounding the school. Some of what they found was “quite shocking”. Ms. Gray noted that students also found shopping carts, couch cushions and a lawnmower – mostly out in the forest near the local school. “Some people clearly have no regard for what they are throwing out and where they’re throwing it,” said Joey Norwich. Following the clean-up day, students spent several days compiling the information and uploading it to Litterati. By far the most common items picked up were cigarettes. According to Peter Morneau, there have been more cigarettes picked up in Orangeville than in Toronto. While the initiative has taught the students valuable skills in teamwork and IT literacy, Ms. Gray is happiest about what Litterati has done to their opinions on littering. “I think it was pretty clear to see from the assembly how passionate these kids are about this now. 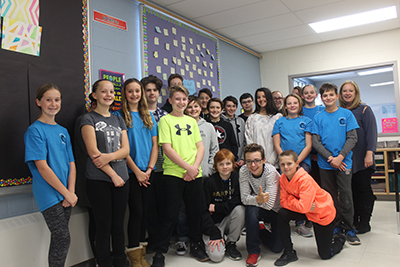 Each and every one of these students have been engaged throughout this process, it’s incredible how hard they’ve worked to bring Litterati to Orangeville,” Ms. Gray said. Nick Farmer admitted he was a frequent litterer before he participated in this project. Now, he’s just focused on preventing as many locals as possible from littering. While their big cleanup is now behind them, the students will continue embrace Litterati. Ms. Gray noted her class had prepared letters that they will be sending out to nearby businesses to offer suggestions on how they can help to reduce littering in the area. They will continue watching the Litterati app in the hopes of seeing the worldwide litter count reach the big million. For more on Litterati, visit literati.org. To follow the Spencer Avenue students’ journey, visit their social media platforms – @graylitterati on Twitter, and @ms.grayslitteratiproject on Instagram.